The Oak Ridge Boys at the Oak Ridge Boys Theater is one of Branson shows where you can have the chance to enjoy the authentic sounds of the Ozarks. The Oak Ridge Boys Duane, Joe, Richard and William provide an entertaining Branson show that will complement your vacation in Branson. This group of country singers has been producing hit music since 1973 and become popular for their four-part harmonies. This group have received numerous awards and accolades throughout their music career that include five Grammy awards, four CMA awards, four Academy of Country Music awards and an induction into the Gospel Musical Hall of Fame. Whether you like to listen current hits of today or favorites like Ozark Mountain Jubilee, the Oak Ridge Boys presents a wonderful time for the entire family. This award-winning Branson show offers an unforgettable entertainment experience for audiences of all ages. You will get to enjoy listening a variety of music genres in this show, including country hits, pop and gospel and their hit songs, “Touch a Hand, Make a Friend,” “Elvira,” “Bobbie Sue,” “It Takes a Little Rain (To Make Love Grow),” “American Made,” “Thank God for Kids,” and many more. As “America’s favorite group”, the Oak Ridge Boys is also one of the most distinctive and recognizable sounds in all of music, their four-part, power harmonies and upbeat songs that have spawned dozens of Country, Pop, and Gospel hits. Their kind of music earned them multiple Grammy’s, Doves, and Country music awards. 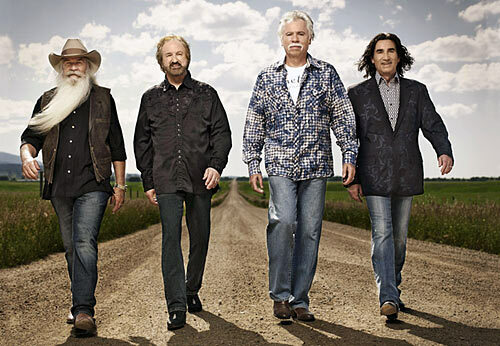 The Oak Ridge Boys have sold over 30 million records and they still continue to release new music each year. This high-energy show has been acclaimed internationally and remains at the heart and soul of their extensive 160-day tours, which regularly take them from the East Coast to the West Coast and into Canada. The Oak Ridge Boys was established as country hitmakers and embarked on a run of chart success that would last through the ‘80s. This group has hit number one in 1980 with “Trying to Love Two Women”. Their recording of “Elvira,” a doo-wop style novelty song from the ‘60s, became a Grammy-winning crossover smash. Its accompanying album, Fan Free, became their first to top the country charts. Their chart-topping “Bobbie Sue,” also went number one country and nearly made the Top Ten as well. “American Made” has also topped the charts in 1983. Their third number one country album “Deliver” have made two more number one hit singles in early 1984. In the latter half of the ‘80s, the Oak Ridge Boys began to slow a bit, but they still produced big hits with regularity. They hit number one in 1987 with “It Takes a Little Rain” and “This Crazy Love”; 1988 “Gonna Take a Lot of River”; and 1990 “No Matter How High”. They’ve got a total of 16 career country chart-toppers and 29 Top Ten hits. So, if you want to listen to the sounds of the Ozarks, don’t miss to check out the Oak Ridge Boys this April in Branson.